My boyfriend and I are both 22 years old. We want to get married and share similar visions and goals for the future. We both love the Lord with all our hearts. We have flaws and love each other past them. His family loves me and mine loves him, except for my mom. My mom actually says she has dreams of him where he is not the one for me. She even prays secretly that we do not ever get married. This hurts me because she is basing everything on dreams and does not want to hear me out at all, or give him a chance. We truly do want to be married one day. But if this is ever possible, how do I handle a situation where my mother (whom I love dearly) won't want anything to do with the person that brings so much love and joy in my life? I would never advocate making a choice to act in a way that damages a relationship with a parent (or anyone else). However, in difficulties like these it’s helpful to remember that not every choice is yours alone, or easy. When a situation is becoming too complex and emotionally entangled, I find it necessary to take a step back and simplify. With that in mind, I think you should handle this disapproval from your mom like you would any person with misgivings about your relationship. Pray for God to make His will clear. This will always be step one of any solution; though, I’ll be the first to admit that I tend to try everything else first. Peace—He promises us that, and we can ask Him for it. We have to entrust to Him the delicate task of speaking to the hearts of others and bringing harmony in a chaotic situation. Ask Him if this relationship is in His will for your life, and if it isn’t – to make that clear to you and your boyfriend. Remember, “God is not the author of confusion but of peace…” (1 Corinthians 14:33). He wouldn’t tell your mom one thing and give everyone else a conflicting message. Praying with your boyfriend about this is important, but make sure you’re also taking the time to be alone with God and really examine the situation objectively. God’s input is the most important, but those around us can have a fresh perspective that is invaluable for finding clarity in muddled circumstances (Proverbs 11:14). I don’t know if open communication has ever been a problem between you and you mom, but it could be that your mom sees things in your relationship that cause her concern, but she doesn’t know how to express that to you. Determining if there really are problems in the relationship and defining them can go a long way toward helping you figure out what’s really going on. Talk to your close friends about what they see, preferably in a way that doesn’t spotlight the conflict with your mom. I know I make a regular habit of asking the people around me to share their perspectives on my relationship. Questions like these will hopefully encourage them to speak openly with you. Talk it over with your mom. 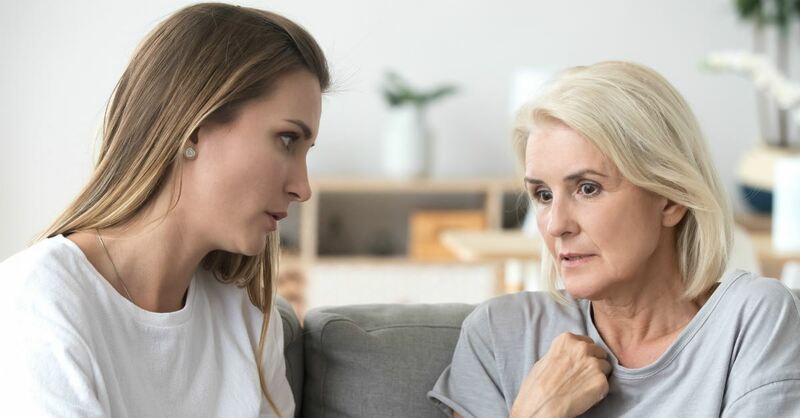 Whether your conversations unearth any serious problems or not, you’ll want to talk to your mom about it. It sounds like you’ve done plenty of talking with her already, but approaching this with the support of others can make a difference. Sit down with her and another trusted friend (someone she knows and respects) and invite her to share with you any concerns she has about your boyfriend. You’re looking for specifics, not dreams. Try to keep the focus on her personal experience with him rather than vague misgivings. She obviously believes the two of you don’t belong together: why? In my own experience, I’ve found that many things I think are unreasonable actually have a root I can’t see. Maybe your mom is afraid of losing you. Maybe she had a bad experience when she was dating that’s causing her to question your relationship now. If you’re praying and communicating with those around you, the water will clear eventually. Does that mean that your mom will accept your boyfriend? Not necessarily. But it does mean that if you’re walking in God’s will, He will give you the peace and clarity you need to make hard choices. If talking to your close friends revealed problems in your relationship, that hard choice might be letting go of your boyfriend and preserving the relationship with your mom. But if your mom is the only one with concerns and those concerns are based only on dreams, then the hard choice might be pursuing your relationship and giving her time and space to come to terms with that. Wishing you peace! Caroline Madison is an Editor at Salem Web Network with a passion for encouraging others in their journey with God. Caroline has led a Bible study for teenage girls and is involved in starting a Letters of Encouragement Ministry at her church.